To ask someone to talk about a book they love is to ask someone to reveal a piece of themselves. I didn’t know this when Nike, Miranti, Dian and I came up with an idea for Cups and Pages, an afternoon of small gathering on books. 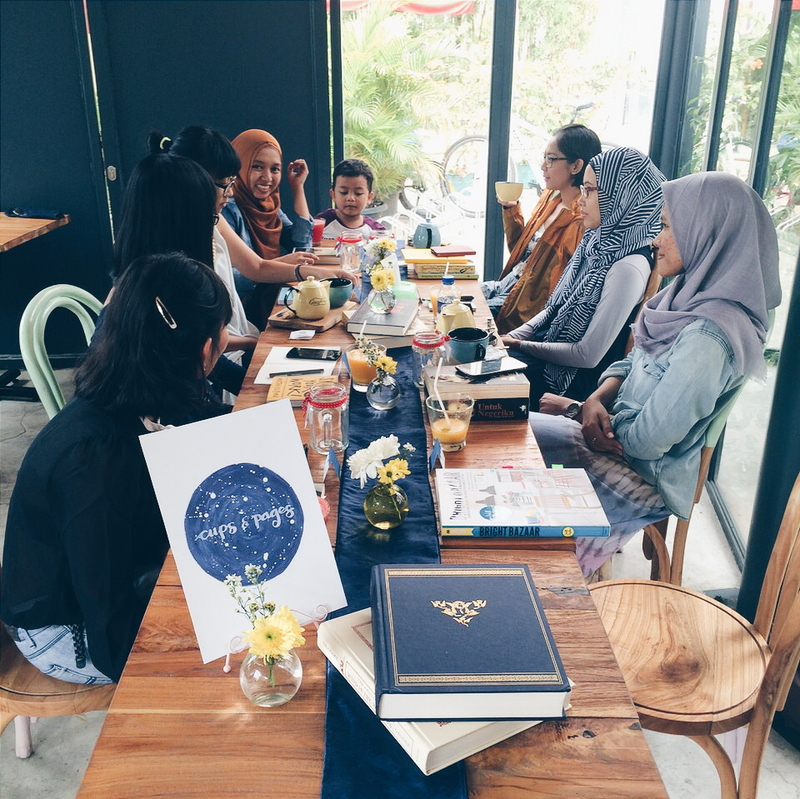 We simply thought that it would be fun to meet people behind the blogs we read and share stories about books that inspire our blogging practice over cups of comforting drinks at Casadina, one of my favorite cafes in Jakarta. We weren’t wrong about the fun part, but really, we ended up knowing much more about the women around the table through their favorite boks although some of us met only for the first time. You could tell right away that Dian and Tia are designers, for instance. Dian started Kemala Home Living, her own line of home décor and tableware, last year, so it wasn’t a surprise that she brought a book about how to use colors in decorating a home. Dian loves Will Taylor’s photographs and advice in his book, Bright Bazaar, but most of all, she kept reading because of his friendly way of writing. Tia, an architect who blogs at Rumah Dua Pohon, brought a photo book called within Small Homes, which reminded me that images could tell as powerful a story as words. It was also easy to see how Nike and Miranti collaborates so well in their blog, LivingLoving. They both talked about books that become their blogging bibles – Nike likes Joy Cho’s Blog Inc because it emphasizes the importance of blogging as a way to build communities, while Miranti finds many practical tips to design and operate a blog in Robin Houghton’s Blogging for Creatives. No wonder I enjoy reading LivingLoving so much; not only it is one of the best designed blogs in Indonesia, I also always learn about other Indonesian creative from their events and stories. 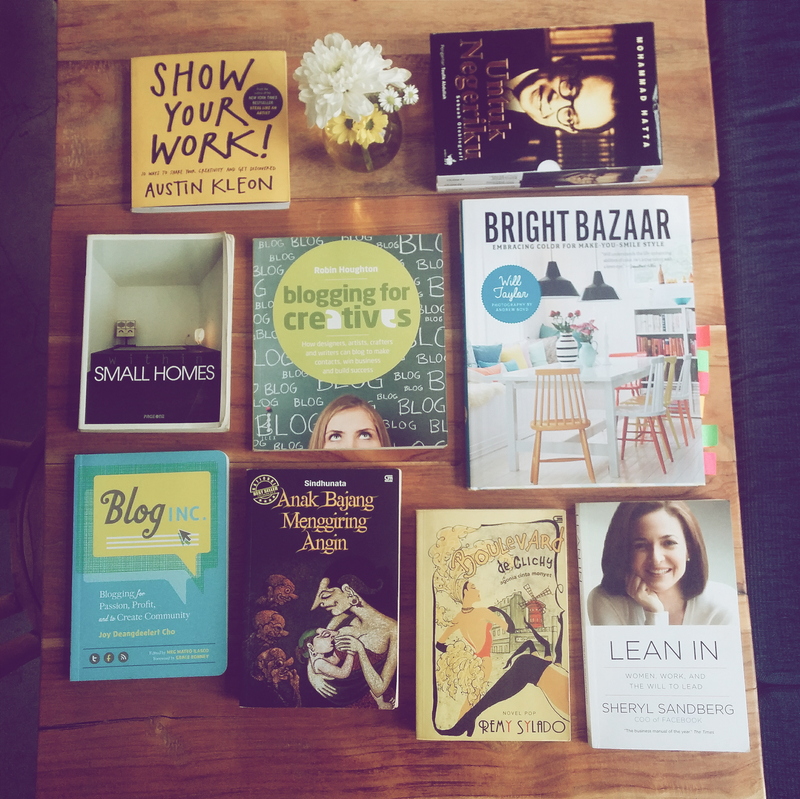 Vina and I shared the books that broke our own inhibitions to write. Vina, half of the duo behind Bracodemag, said that Sheryl Sandberg’s Lean In inspired her to write about feminism in her daily life as an urban, middle class woman. The book was bashed by many feminists for only talking about a white, upper class woman’s struggle in advancing her career, while neglecting the realities of women from different backgrounds, but for Vina, someone could only speak truthfully about their own reality because it is the only one they experience. I found inspiration in Austin Kleon’s Show Your Work, which breaks the myth that you should only show a final, polished piece of work instead of a work in progress. Sharing your process, questions, and inspiration can help your audience get a sense of who you are and even spark collaboration with like-minded people. Titiw agreed with me. One of her favorite Indonesian authors, Remy Sylado, told her that the best thing one can do is to continue writing as long as we could because there is a chance that someone will find it helpful. That’s why she pushes all desires for perfection and keeps blogging as often as she could, on topics ranging from her travels to her wedding preparation, for sharing is the ultimate way of caring. 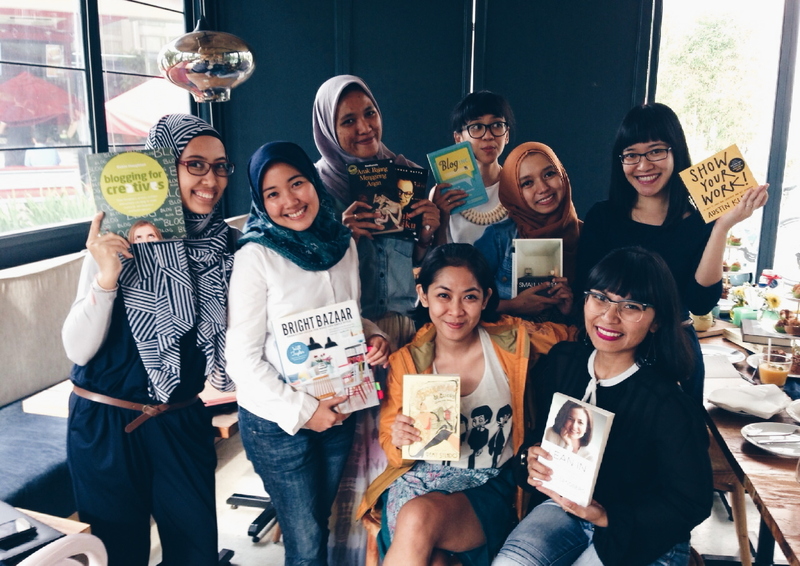 Tyas maintains her personal blog to reflect out loud and came with books that helped her face with challenges that she is facing. Bung Hatta’s tetralogy, Bagimu Negeri, reminded her of one’s responsibilities to contribute to their nation, while Romo Sindhunata’s reinterpretation of the Ramayana epic opened her eyes to the laws of nature that humans might not be immediately aware of. Our small gathering ended with new books for my reading list and new friends I would love to keep in touch with. Someone said to me lately that one shouldn’t start a conversation with a stranger with a question of what they do, for someone is defined by so much more than how they earn their living. After our afternoon of cups and pages, I might start asking them what their favorite books are instead. P.S: For more stories of the first Cups and Pages, visit Tyas’s blog and LivingLoving. P.P.S: We had the second Cups and Pages themed ‘The Object of My Affection’ on Valentine 2015. You can read Miranti’s account of the event on her and Nike’s blog, LivingLoving. 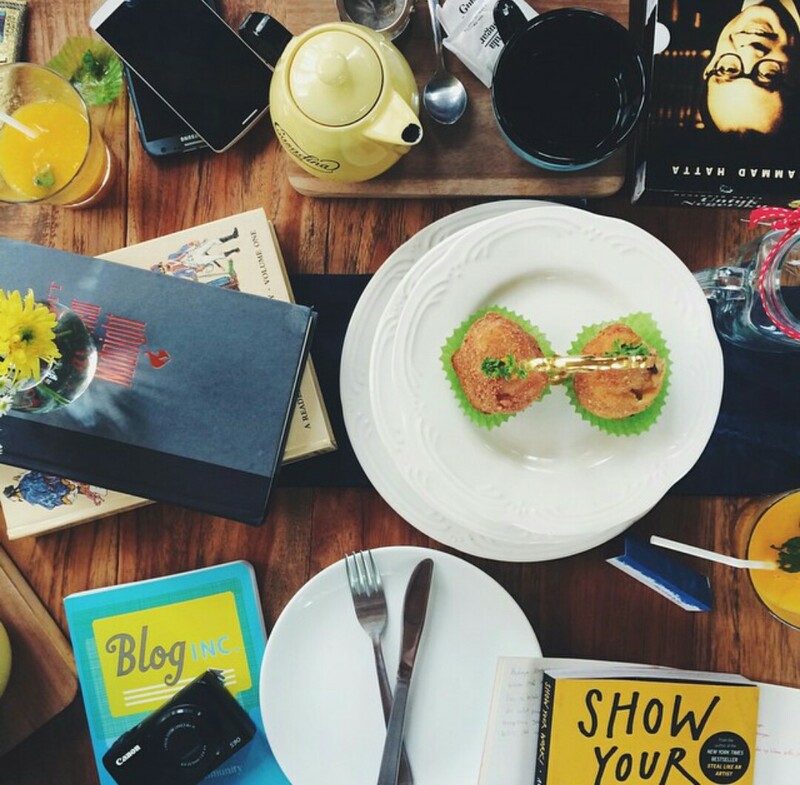 This post was written during the 4-Hours Writing Challenge at POST, a space for books, gatherings and all things creative in Pasar Santa that I started with Twosocks and our friend Steven.